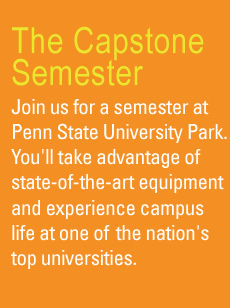 All academic programs supported by the NMT Partnership require a Capstone Semester at Penn State University Park. This component is arranged by your home institution and is offered during the fall, spring, and summer semesters. The semester includes 18 credits of coursework and offers access to state-of-the-art equipment and cleanroom facilities. The 18 credits earned in the six-course Capstone Semester apply to every student’s career path. When taken as a two-year degree, the 18 credits you earn in your Capstone Semester can later be transferred into select four-year degree programs across the state. Pennsylvanians' simply pay the tuition for the Capstone Semester credits to their home NMT partner institution according to its current tuition rates. Coursework is continuously evolving to keep the content up to date. Learn more about the coursework. Pennsylvanians pay the tuition for the Capstone Semester credits to their home NMT partner institution according to its current tuition. Receive hands-on training with the latest nanotechnology fabrication and characterization equipment at one of the nation’s leading research universities. As a NMT Capstone Semester student, you’ll receive the most current, hands-on exposure available in nanofabrication manufacturing and characterization technology. You’ll work in groups with other students from different schools and diverse backgrounds, enhancing each other’s experience. Capstone graduates enjoy exclusive access to a powerful job network and receive industry announcements and job postings, even if they are continuing their education. CNEU staff members teach the capstone semester during all three of Penn State’s scheduled semesters and continuously evolve these courses to add or update process and characterization technologies. Refinement of the capstone semester is carried out in close consultation with the industry members of the NMT Program’s Advisory Board. This course overviews basic material properties as well as environment, health, and safety (EHS) issues in equipment operation and materials handling in “top down” and “bottom up” nanofabrication. The chemical and physical materials properties underlying nanotechnology are surveyed. EHS topics arising from the processing and disposal of these materials are addressed including: cleanroom operation, OSHA lab standard safety training, health issues, biosafety levels (BSL) guidelines, and environmental concerns. Specific safety issues dealing with nanofabrication equipment, materials, and processing will also be discussed including those pertinent to wet benches, thermal processing tools, plasma based equipment, optical, e-beam, stamping and embossing lithography tools, vacuum systems and pumps, gas delivery systems and toxic substance handling and detection. This course is an overview of the broad spectrum of processing approaches involved in “top down”, “bottom up”, and hybrid nanofabrication. The majority of the course details a step-by-step description of the equipment, facilities processes and process flow used in today’s device and structure fabrication. Students learn to appreciate processing and manufacturing concerns including safety, process control, contamination, yield, and processing interaction. The students design process flows for micro- and nano-scale systems. Students learn the similarities and differences in “top down” and “bottom up” equipment and process flows by undertaking hands-on processing. This hands-on overview exposure covers basic nanofabrication processes including deposition, etching, and pattern transfer. This course is a hands-on treatment of all aspects of advanced pattern transfer and pattern transfer equipment including probe techniques; stamping and embossing; e-beam; and optical contact and stepper systems. The course is divided into five major sections. The first section is an overview of all pattern generation processes covering aspects from substrate preparation to tool operation. The second section concentrates on photolithography and examines such topics as mask template, and mold generation. Chemical makeup of resists will be discussed including polymers, solvents, sensitizers, and additives. The role or dyes and antireflective coatings will be discussed. In addition, critical dimension (CD) control and profile control of resists will be investigated. The third section will discuss the particle beam lithographic techniques such as e-beam lithography. The fourth section covers probe pattern generation and the fifth section explores imprinting lithography, step-and-flash, stamp lithography, and self-assembled lithography. This course covers the applications of nano-scale devices and systems and the material chemical, physical, biological, or multiple-property requirements necessitated in these applications. Material modifications to meet these requirements will be addressed including structure control, composition control, surface property control, strain control, functionalization, and doping. This course examines a variety of techniques and measurements essential for testing and for controlling material fabrication and final device performance. Characterization includes electrical, optical, physical, and chemical approaches. The characterization experience will include hands-on use of tools such as the Atomic Force Microscope (AFM), Scanning Electron Microscope (SEM), 1 nm resolution field emission SEM, fluorescence microscopes, and Fourier transform infrared spectroscopy. Click here to view the NACK Nano-Technician skill set.